As we come ever closer to 2012, it seems all too necessary this week to carry on from last week’s piece by examining Africa’s recent struggles on its path to unity and a more prosperous region. Certainly, with 2011’s cataclysmic changes taking place in North Africa, most of the Africa Union’s attention has been heavily turned towards the Arab Spring and its aftermath. Nevertheless, the organisation has not been without its own crises to manage in the sub-Saharan region. The Western-backed referendum for self determination in the South Sudan, finding its roots in the comprehensive peace deal of 2005, put an end to the decades-long civil war between Omar el Bachir’s north and the late John Garang’s (now ruled by Salve Kir) South. Underlying this conflict is a dispute over borders, respect for human rights and, more importantly, the re-partition of Sudan’s petroleum wealth, located primarily in the South but thoroughly sapped by the North. Anyone with any knowledge of the Sudan’s complex ethnic and religious geography will certainly agree that it is a miracle that the political union between North and South had lasted this long to begin with. Once Africa’s biggest country in size, Sudan is obviously yet another victim of poorly-drawn post colonial borders. However, South Sudan’s wish to seek independence also stems from a need to end the discrimination its population has faced at all levels at the hands of the North. July 9th 2011 marked the birth of the South Sudanese nation and while there was reason to rejoice, African Union leaders expressed their concern behind the scenes that this division would set a dangerous precedent for secession throughout the continent. They are wrong to think it. South Sudan is also a case of the right to self-determination. Indeed, the determination of the South Sudanese and their unity as highlighted throughout the civil war and the voting process was proof to all that this was indeed a need to escape the North’s unjust tutelage. Ruled by strict Sharia law enforced by the Arabic-speaking elite, the Christian and largely African (i.e. not considered ethnically Arab) South Sudanese were held back from achieving their full potential or even enjoying the dividends brought by the petroleum extracted from their own region. With no one to adequately hear out their grievances, who can blame them for wanting to go their separate way? This pattern of minorities being oppressed throughout the continent is also likely to repeat itself if leaders do not adhere to respecting the fundamental human rights set forth by the African Union’s Human Rights Charter. The quest for unity, as underlined by the Sudanese case this year, continues to be hindered by a blatant disrespect for minorities, not only their socio-cultural norms, but also their political/economic rights. Rather than moan as to the supposed imperialist pretensions of Western Powers to divide and conquer, perhaps a more interesting and sustainable approach for African Union leaders would be to see to it that local grievances are addressed before conflicts are likely to emerge. Another crisis the Union has had to face this year, has been that of the Ivory Coast. The final months of this past year saw the deposed Ivorian president Laurent Gbagbo appear before the Hague tribunal to defend his responsibility in the the lead-up to sectarian violence in the West African country. By disputing a clear yet unfavourable result in Ivory Coast’s presidential, Gbagbo and his lieutenants pushed the country towards civil strife. Though the election had been heralded as the country’s opportunity to break from a tormented past of political violence originating in ethnic and sectarian differences, Gbagbo’s unwillingness to relinquish power saw to it that the election turned into stalemate which paralysed the country until a France-led effort was put in place to oust him from power. The new president Alassane Ouattara, a former prime minister and IMF executive will oversee what many international observers believe to be a speedy recovery and hopefully turn a troubled page in his nation’s history. Gbagbo’s trial before the Hague can and will be spun as another symbol of double standards in the international community but what cannot be denied is that his fate might yet serve as an example for would-be despots on the continent unwilling to accept democratic elections processes and outcomes. Perhaps the most pressing issue that had been dividing the African Union’s decision-makers this year has been Gaddafi’s demise at the hands of Libya’s revolutionaries and their NATO allies. The war in Libya, largely condemned by the African Union, means the end of a man who had come to personify the myth of African Unity. Will his passing mean the end of the Pan-African ideal? To counter Western ‘Imperialism’, Gaddafi vehemently advocated a ‘United States of Africa’ under a common banner, currency, institutions and even military. He supported small nations by funding their AU membership, and often sponsored infrastructural projects throughout the continent. Nonetheless, these supposed acts of solidarity were often cancelled out by his support and often shady alliances with rebel groups in already destabilised African nations (e.g. Liberia, Tchad). He also brought ridicule to the continent through his unpredictable publicity stunts aimed at glorifying his role in the organisation. In 2008, he graciously accepted a supposedly consensual call from African tribal elders and kings to receive the un-traditional title of ‘African King of Kings’. Many of his African peers staunchly opposed his offers for political unity suspecting they were largely aimed to serve his own purposes. Throughout the war, the Union’s members were clearly divided between those supporting a political solution to the conflict and those supporting NATO’s efforts in aid of the rebellion. 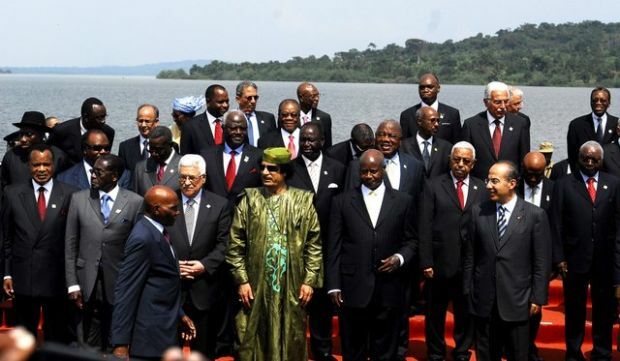 The July AU summit held in Malabo, Equatorial Guinea highlighted these differences. AU commissioner Jean Ping called the ICC ‘discriminatory’ for solely going after African leaders, but his message contrasted with many former rebel leaders on the continent now heads of state, who support the ICC’s actions. Now that Gaddafi has gone, the AU should not expect any favors from Libya’s new rulers, who did not take kindly to the criticism they received during the uprising. One of the AU’s primary financiers, Libya’s new position in the organisation now seems rather uncertain in light of the Union’s slow recognition of the post-Gaddafi regime. Key questions surround the Pan-African struggle for unity at the start of 2012. Members should ask themselves: what does it mean to be an AU member today? What benchmarks constitute the fundamental basis through which political cooperation in the Continent is possible? What will the AU truly stand for? Certainly, on a number of regional and foreign policy issues, real consensus has yet to be truly achieved. The truth is that Africa’s Unity depends largely on the ability of the continent to move forward in its development at the national level first. One African currency and a united political system will do little to bring the continent out of poverty if political elites at the national level remain corrupt and untrustworthy. What’s more, as most AU summits demonstrate, the personal and national interests of member-states and their leaders continue to fragment most efforts to move the Union forward. Though North Africa reached boiling point with the political paralysis that had mired its development for so long, the same cannot necessarily be predicted of other nations in sub-Saharan Africa. Many countries in Africa continue to be ruled by despots and authoritarian governments unwiling to adequately articulate their populations’ willingness for unity and change. Mismanagement of economies and widespread corruption have lead to endless civil strife, abject poverty and weak state infrastructures. Africans and their leaders first need to get serious about the need for accountability at the highest levels in order to achieve the noble goal of unity as set forth by the Union’s founding fathers at the height of the decolonization struggle.